Don't Avoid The "Dirty Dozen"
Eat Your Fruit and Veg, Don't Avoid the "Dirty Dozen"
The Environmental Working Group (EWG) puts out a list every year to help guide shoppers on which produce to buy. Their "Dirty Dozen" is a list of produce that contains pesticide residues. The EWG is a non-profit, non-partisan organization dedicated to using the power of information to protect human health and the environment. Their funding sources include corporations (3% of their total funding as reported on their website). This year, a scientist at UC Davis, Carl Winter, Ph.D., published a paper which says that the EWG's Dirty Dozen list is not scientifically sound. His study was not funded by the food or pesticide industry and he has NEVER taken an industry dollar in his career. The EWG's "Dirty Dozen" study was done by the EWG and has not been published in a scientific journal. Why does that matter? Well, it makes it impossible to analyze their methods for attaining their results. You have to have faith that EWG did their analysis correctly, while a scientific paper has all the methods and data analysis PUBLISHED where you can see it. Snack Girl: What is the process for publishing in the Journal of Toxicology? Dr. Winter: I believe that two independent experts were contacted by the editor of the Journal of Toxicology to provide their reviews. The reviewers assessed the accuracy, methods, and conclusions of the paper and provided recommendations for further improvement of the paper. A revised manuscript was then submitted to the editor of the journal that incorporated many of the reviewers' suggestions, and the editor made the final decision to publish the manuscript with the revisions. Snack Girl: Did you use a different data set from the EWG for your work? Why do you think your analysis of the data is more accurate? Dr. Winter: I used data from the same program as EWG - the USDA's Pesticide Data Program. While it was impossible to tell from the EWG's methodology how far back they went with the USDA's data, I used data from the most recent year of USDA sampling for each of the commodities. The EWG primarily focused its efforts on looking at the presence of pesticide residues; my analysis was much more robust as it looked at the amounts of pesticides detected (not just presence or absence) as well as the toxicity of the specific pesticides and consumer consumption patterns for all of the fruits and vegetables. Snack Girl: What about the EWG's methodology lacks scientific credibility? How did they get it wrong? 3) the toxicity of the chemical in question. With the tiny exception of one of the six criteria they evaluated (average amount of residue detected, which was not specific to individual pesticides), the EWG neglected to include any of these. Basically, the recommendations that consumers avoid conventional forms of the "Dirty Dozen" commodities were made solely upon the basis of the presence of pesticide residues in the foods, which paints an extremely incomplete picture of the potential risks from pesticides in the foods. Snack Girl: Your results found that the "Dirty Dozen" pose a negligible risk to consumers, do you think that pesticides residues are ever harmful? Dr. Winter: There have been a handful of cases where blatant misuse of pesticides has resulted in consumer illnesses from pesticides in foods, particularly in other countries. Such cases are extremely rare, and the results of hundreds of thousands of regulatory monitoring samples taken by the USDA, FDA, and state governments consistently show that levels found are not of health concern. Snack Girl: You state that eating organic forms of the "dirty dozen" does not result in reduction of consumer risks. Is this because there wasn't a big risk with conventional produce in the first place? Dr. Winter: Precisely. In general, our exposures to individual pesticides in foods are at least 10,000 times lower than levels that don't even produce any signs of toxicity in laboratory animals when the animals are given the chemicals on a daily basis throughout their lifetimes. While one can reduce his/her exposure even more by selecting organic foods, this reduction doesn't result in any meaningful reduction in consumer risks since the risks were so low to begin with. Thanks, Dr. Winter for your responses. The Shopper's Guide is an easy way for consumers to see the pesticide residues and overall amounts on the most popular fruits and vegetables. Each year, EWG researchers analyze the USDA's annual pesticide residue tests in order to compile the most recent Guide. It is not published in a peer-reviewed journal. However, EWG and its research department stand 110 percent behind the methodology. ummmm. really? This is your answer? How about - "We are planning to publish our research in the Journal of Toxicology next year." 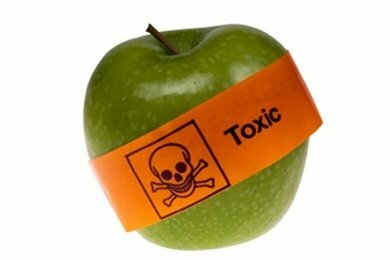 If you found an amount of pesticide in twelve different types of produce that is actually TOXIC to humans - then your "Dirty Dozen" would be correct. People already have enough trouble choosing healthy food without the EWG scaring them about conventional produce. What do you think of the EWG list and research? This is very interesting! Thank you for sharing! the benefits of eating fresh produce Definitely outweighs pesticide risk. Great article! I completely, 100% agree with this. Kudos! Good to know! Thanks for posting about this! I agree that it's better to eat conventional produce than to not eat your fruits and veggies at all. But make no mistake, pesticides and herbicides are not safe for human consumption. Some would say that "high fructose corn syrup in moderation is okay." But when HFCS is in EVERYTHING, it's no longer moderated and is very unhealthy. If you're eating convention produce, processed products made with fruits and veggies, etc. than you're going to have a significant amount of exposured to the -icides. Choose organic whenever you can. Shopping farmers' markets are a great place to get cheaper produce and if you talk to your farmer you may find that they use organic practices even if they aren't certified. @Marisa - The cereal I recommended had less 3 grams less sugar per serving than the other brand. Yes, I wish it didn't have artificial colors or preservatives - but I am more concerned with the sugar. Secondly, I have found no evidence that Dr. Winter is in the pocket of anyone except the tax payers of California as he is an employee of UC Davis. If the EWG study is robust then they should publish it in a reputable scientific journal just like Dr. Winter. This is how science moves forward through a back and forth discussion and review process. Right now, EWG is operating outside of that process and therefore their results are suspect. So Snack Girl, are you trying to attract certain advertisers to your site? Pesticides are unhealthy--the use of them is polluting our water and environment. So buying produce without pesticides may enventually prompt the food growers to stop using pesticides. Some people may be more affected by consumed pesticide residue and over time, the cumulative consumption of pesticides may cause cancer or other health issues. Food with pesticide traces or no pesticides--hmmm, is there really a debate here? Recommend a produce wash, suggest people buy organic whenever possible...please promote good health. And many studies in scientific journals are slanted towards the pharmaceudicals or whoever has the most money--contrary information is not included and only the desired results are kept and noted. "Reputable" scientists go on to work for the companies their studies would affect--so better to give a favorable result and get a lucrative job later. This is a major problem with folks working for the USDA and FDA--they'll do whatever it takes to ensure a big fat salary in the private sector, including lying to the public. Follow the money. Wow. I am really really disappointed with this post. One thing that isn't really mentioned here is the fact that when pesticides are tested as "safe," this is in a vacuum. They are not tested for safety in combination with the mountain of other chemicals and pesticides we are exposed to every single day - and in fact, some researchers believe it is actually the combination of these substances that is most dangerous. It makes sense, then, to limit our exposure to chemicals as much as possible. This is especially true when we're talking about children, who are far more sensitive to environmental toxins. I have personally never felt "scared" by the EWG. I've been grateful to have SOME kind of guide to foods that are likely to have more of the chemicals I PERSONALLY want to avoid. Since our government refuses to do so - and has proven repeatedly NOT to be on the side of consumers - I am overjoyed that someone is helping us identify those foods that contain the most chemicals. In fact, I think I should head over there and donate - and encourage anyone else annoyed by this post to do so as well. I think this is great information - I have always wondered about the levels of pesticides found on the "dirty dozen" and how much of that we are actually ingesting. It's nice to know that when you can't eat organic that regular fruit and veggie consumption still outweigh the risks of pesticide exposure. It does make me wonder why the EWG doesn't want to publish their results and findings if they feel like they are doing such a service to everyone. Also, I think another commenter mentioned fruit/veggie wash - I always wonder if that even does anything? I mean, if they are doing periodic spraying of fruits/veggies at different growing stages, wouldn't pesticide be on the inside of it too?? Not judging, just trying to understand both sides to this. @Claire - I agree with you that there are scientists that are corrupt. But in my experience, a vast majority of them want to do good science that is unbiased and ethical. Why do you think the EWG is ethical and Dr. Winter isn't? If you follow the money, EWG has taken money from corporations and Dr. Winter has not. And as for me - I have published my policy regarding advertising, sponsorships, etc. here: http://www.snack-girl.com/a/about/ and I am following the FTC guidelines regarding sponsorship and advertising. My motivation for writing this article was that I do not want people to be afraid of eating fresh produce that isn't organic because of fear of pesticides. Wow, I knew things were going downhill on this site, but this was a serious shocker. I opened this email thinking "oh it'll be another one where she shuts down someone trying to muddle the issue of healthy foods," but no. I 100% agree with the person above where we should buy as much organic as possible to encourage organic growers because personally, I'd rather have NO pesticides, and that's one of the purposes of organic! It is true eating conventional produce is better than eating none, but I approve of the dirty dozen list because it makes sense - it's any product where you eat the skin and/or has a permeable skin so the pesticides soak in and you can't just wash them off. There are many "credible" journal articles "proving" global warming is a myth, but all you have to do is look around! It's the same principle - we have so many more health problems today that people didn't have when they weren't ingesting all these chemicals. Plenty of FDA studies go through "proper channels," but they still release stuff that is dangerous and stifle new ideas because everyone is in someone's pocket these days. I think I'm sticking with Dr. Mercola from now on - while he may go a little far on some things, he sounds much healthier than you. Officially unsubscribed. Also worth mentioning here that "scientists" and the USDA say that ammonia-laced meat sludge is "safe" for our kids to eat in school meals. They also say it's "safe" to eat factory-farmed meat - despite the ridiculous number of people who become ill or even die from food poisoning due to the horrific sanitation conditions. And as a final point, organic farms are far more likely to be small family-owned farms. So when you buy organic, you aren't just supporting the organics movement - you are supporting actual families with real farms - not megalithic corporations that don't care one bit about the land, the communities they inhabit, or the ecosystems they annihilate with their dangerous and toxic "growing" practices. I just can't stop being disturbed by this post. Hello again and thanks for your response to my previous post. You say Dr. Winter does not take money from corporations...well, he got a huge grant from the USDA, and the USDA is filled with unethical "scientists" with ties to Monsanto. Do an Internet search for Roger Beachy, who worked for the main research arm of the USDA and has ties to Monsanto. Beachy was quoted as saying "I'm concerned about the safety of organic food... I'm concerned about the issue of microbial contamination with organic." Beachy promoted GMOs and is anti-organic. Give him time, Dr. Winter will no doubt be working for Monsanto, either directly or indirectly and of course he's going to ensure he's on the side of possible future employers. Relative to your post, do you REALLY think people are eating less produce for fear of pesticide contamination? The people who truly care about the quality and safety of their food, are the ones seeking the best options and ensuring they eat a HEALTHY diet. The rest of the people out there are eating anything, regardless of the pesticides, GMOs, etc. Bottom line: all companies, farmers, growers, & makers should give full disclosure of what we're eating and honest labeling...isn't that what the FDA and USDA are supposed to ensure? Let me decide if I want to eat something grown with pesticides or not and likewise with GMOs. While I agree (in theory) that buying organic foods at store is better, in practice it is usually not that affordable or that much better for the environment. If you truly want organic go to your local farmers and support them, not the big agribusinesses that are buying up all the organic labels and the chemical companies that are buying Natural Grocery stores with politics. Eat local and in season. And yes, Claire, some people do eat less because they are being scared non stop by people like Mercola who claim everything is poison, but they can't afford the organic prices. I think this is a great post and some people are missing the point. Fresh produce (even non-organic) is better than no produce. As far as the cereal options go, you are trying to simplify the process by looking at only a few key points instead of reading the entire label. Most people just don't have the time for it. I enjoy your blog very much, keep up the good work! First of all , I want to say I appreciate all your hard work and trying to show both sides. While I don't agree with this info, I do like you are presenting both sides. I am currently dealing with the issue at my kids school . I am trying to get organic apples in the cafe, because the level of pesticides over time in apples is toxic to little bodies. If you eat seasonal. Organic or local produce that is not spayed is doable. Amy, I don't think anyone here has missed the point. The post doesn't say "nonorganic fresh produce is better than no produce" - it is an attack on Environmental Working Group for not publishing in scientific journals - despite the fact that they have NEVER made claims that, say, a single nonorganic apple is "toxic." They produce a list of the twelve foods with the highest and lowest amount of pesticide residue, based on the exact information this researcher used here. EWG NEVER tells people not to eat nonorganic produce - if anything, their "clean" list would only encourage people to buy those vegetables and fruits instead. I don't understand why anyone would object to those of us who prefer NOT to eat pesticides having the information about which produce is most likely to have pesticide residue so that we can choose to eat what we want. And while I think it's fine to disagree with us and to buy all nonorganic food, I think it's crappy to attack a nonprofit and act as if they're on some mission to horrify people and demand they publish findings when they're using USDA data. Maybe the intention was ok, but the delivery sucked. Hey snackgirl, thanks for the info. I actually like reading both sides of the story. I know you are getting slammed here but please continue your balanced info.